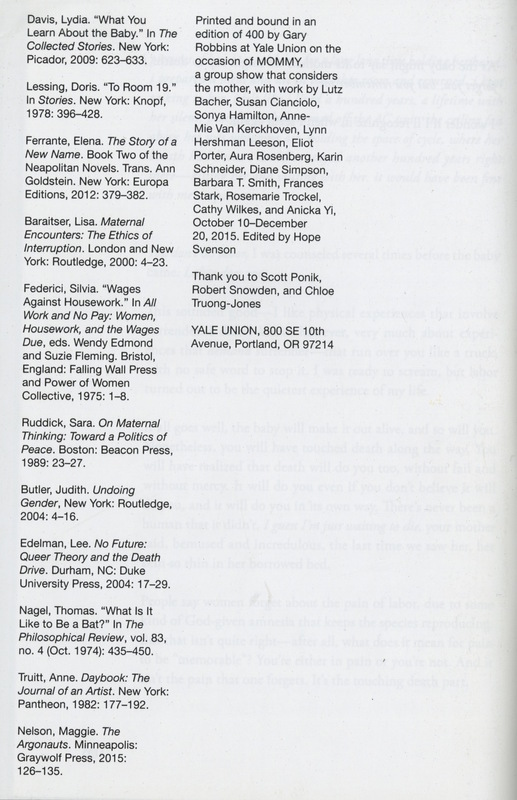 A publication printed on the occasion of MOMMY, a group show that considers the mother, with work by Lutz Bacher, Susan Cianciolo, Sonya Hamilton, Anne-Mie Van Kerckhoven, Lynn Hershman Leeson, Eliot Porter, Jeff Preiss, Aura Rosenberg, Diane Simpson, Barbara T. Smith, Frances Stark, and Rosemarie Trockel. It also included new site-specific works by Cathy Wilkes and Anicka Yi, and a performance by Karin Schneider. Selected writings by Lydia Davis, Doris Lessing, Elena Ferrante, Lisa Baraitser, Silvia Federici, Sara Ruddick, Judith Butler, Lee Edelman, Thomas Nagel, Anne Truitt, and Maggie Nelson. Offset printed and staple bound in an edition of 400 by Gary Robbins at Yale Union in September 2016. Edited by Hope Svenson. Designed by Scott Ponik. Thanks to Robert Snowden and Chloe Truong-Jones.